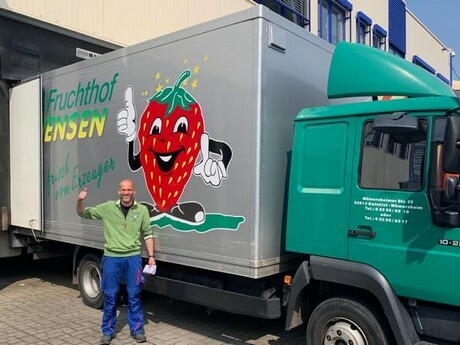 "Easter sales will get going in the course of next week"
On Monday, the first greenhouse strawberries of this year's season were harvested at the Fruchthof Hensen in Swisttal. Sales and prices are difficult to predict at the beginning of the season, reports Irmgard Hensen. "The demand is quite large, although there are currently many Spanish strawberries on the market. As soon as one hears that regional strawberries are available again, the demand immediately develops. The varieties that we grow under glass or foil are also significantly different than those from southern Europe. However, we are in direct competition with the Dutch producers, who bring mostly similar varieties to the market." 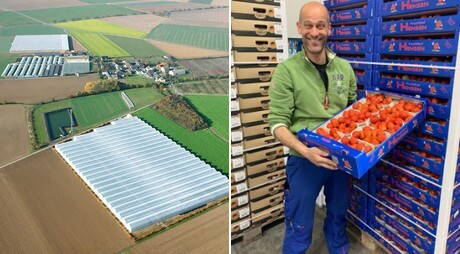 Depending on the season, greenhouse, foil and pure outdoor cultivation are combined on the mixed fruit farm. Under glass, primarily the Elsanta and Opera varieties are grown. The entire outdoor area (about 150 ha) remained almost the same, but was also converted to a new cultivation technique. "In addition to the film tunnels and pure outdoor cultivation, we also have a part where there is cultivation on racks. The advantage of this is that the pickers -similar to the glasshouse - go through the row with a cart and do not have to bend over. This makes the work physically easier for the harvest workers and at the same time increases their picking performance," says Ms. Hensen. Left: The Hensen facility. Right: Mr. Muth shows the first strawberries of this year's season. 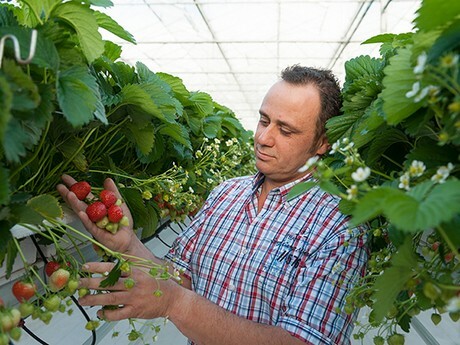 After harvesting, the strawberries are carefully prepared and packed in 250 or 500 g trays or in plastic reusable crates (IFCO or EPS) or cardboard boxes, as required. The social debate about packaging has also left its mark on the company. Ms. Hensen: "We package a substantial portion of our goods in consultation with our customers in wood pulp or cardboard trays and/or returnable crates." The first strawberries of the season are delivered. The lion's share of the goods lands via the cooperation partner San Lucar in the nationwide food retail trade (LEH) or on the wholesale markets; the remaining products are marketed directly from the farm. In general, conditions are becoming more difficult for domestic producers, says Hensen. "In Germany, wages for harvest workers are increasing, but this is not reflected in the producer prices. The first varieties are usually still sold at a higher price by about €6 / kg. As soon as the tunnel cultivated goods are added and the supply increases, the prices go down as well. We strive to provide the highest possible consistent quality even in difficult weather conditions, but prices are about the same." 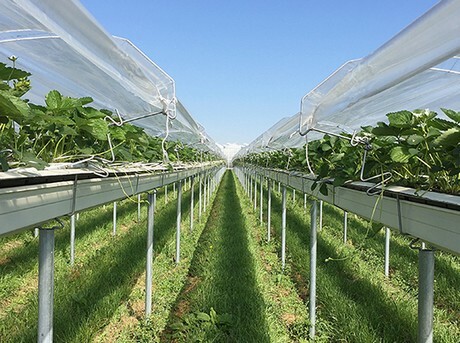 Protected cultivation on racks in the open air is the latest variant in strawberry cultivation. At Easter, sales will increase significantly both in food retailing and direct marketing. "At the moment, it can be assumed that the peak season will really kick off in the next week," concludes Ms. Hensen.